Cantare – Cantate – Cantemus! 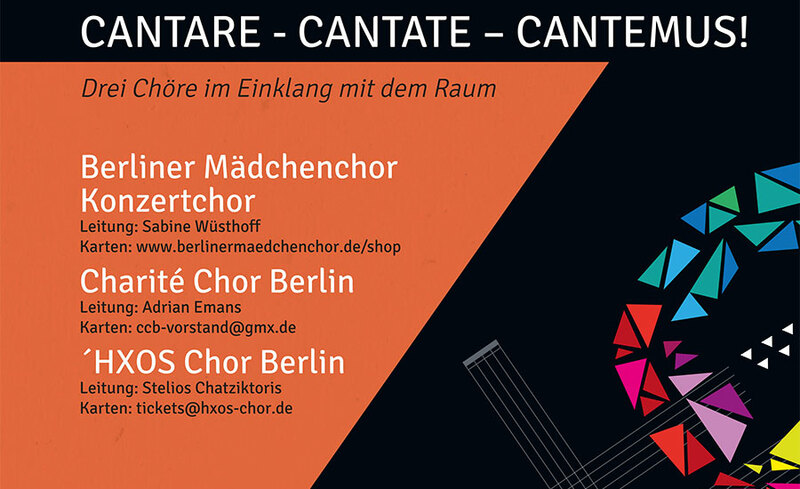 Two young chamber choirs – ’HXOS Choir Berlin and Charité Choir – and a girls’ choir – the concert choir of the Berlin Girls Choir – join for an unusual project of sound and space in different perspectives. The participating choirs will present solo pieces, individual choir performances and works, in which they sing together. This concert will be characterized by an unique choregraphy. The three choirs are going to exploit the wide range of opportunities of singing together. The concert happens within the Sunday concert series 2018 of the Berlin Choral Association at the chamber music hall of the Berlin’s Philharmonie.